Este documento en formato PDF 1.4 fue generado por Writer / OpenOffice 4.1.1, y fue enviado en caja-pdf.es el 22/01/2019 a las 11:15, desde la dirección IP 188.78.x.x. 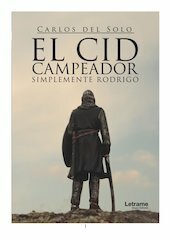 La página de descarga de documentos ha sido vista 232 veces. Tamaño del archivo: 2.1 MB (45 páginas). I - Spring of the year 1063. Ramiro I of Aragon besieges the city of Graus. troop where the vanguard was before. What a chaos was made! The Aragonese infantry starts to advance. know. We had just arrived, and it has not given us time to study it. as possessed by the devil. &quot;Rodrigo, this looks bad. I thought I'd catch my uncle for surprise. take. Ideas are accepted, friend Rodrigo!&quot; Sancho shouts to be heard. on them, but it is late, and the collision is imminent. aching by handle the heavy sword. raise my sword threatening them. They run in terror. troops run to retreat at their rear. We won the battle! remember a lot about father too. remained in court, but I had not faced the avatars of a real battle. The war is very sad, mom, I've seen things I couldn't even imagine. details with you about what was lived, so I'll leave it there. end of the battle, I found him, frightened, but safe and sound. as a Christian. Then I found out that the soldier is called Sadadah. &quot;Oh, Sancho, I think I know who is wearing the pants in this house. Ha, ha, ha!&quot; I tell the Prince when we are left alone. cannot bear to see a child having it rough. recognize that tonight I have slept well in that fluffy, fragrant bed. am going to be today at the end of the journey. calmed their thirst. Then we continued on our way to Burgos. clear that it has always been a transfer area since immemorial time. side, just as I have done so far in all the tasks that I was entrusted. front! And it seems to me that the same problem is going to affect me. Este archivo fue compartido por un usuario del sitio. ID del documento: 01873558.